While the needlebook is getting the bulk of my stitching time at the moment, the black dog hasn’t been entirely neglected. I’ve finished the satin stitch padding, and begun stem stitching my way around both the outline of the dog and the outline of the knotwork. 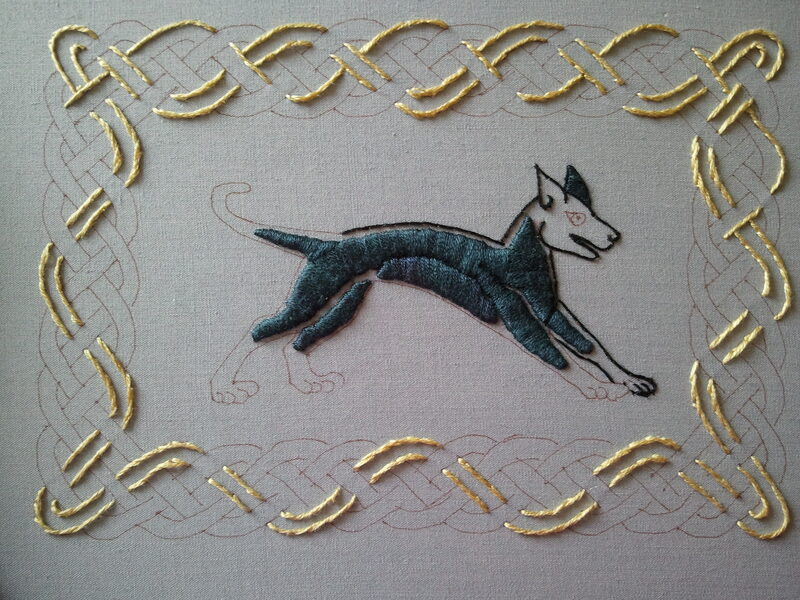 While the outline of the dog and the outline of the knotwork are done in stem stitch, the black is one strand and the gold is three strands. After the knotwork outline is done, I’m going to fill it in with a variegated blue in split stitch. I’ve done knotwork before, but mostly using satin stitch, and I’m excited to see how this will turn out. My thought is that it will have a more ribbon-y feel when the stitching follows the knotwork lengthwise rather than across, but we shall see. These little mice (for yet another box lid) are an experiment in texture. Wow! Those rats are gorgeous! I love how they look. These little guys aren’t quite that sophisticated–hope they turn out half as well. There’s an instant impulse to pet Black Dog, which is a good thing, I think. 🙂 The padded stitching works beautifully. Thanks on the rats, those were tricky. 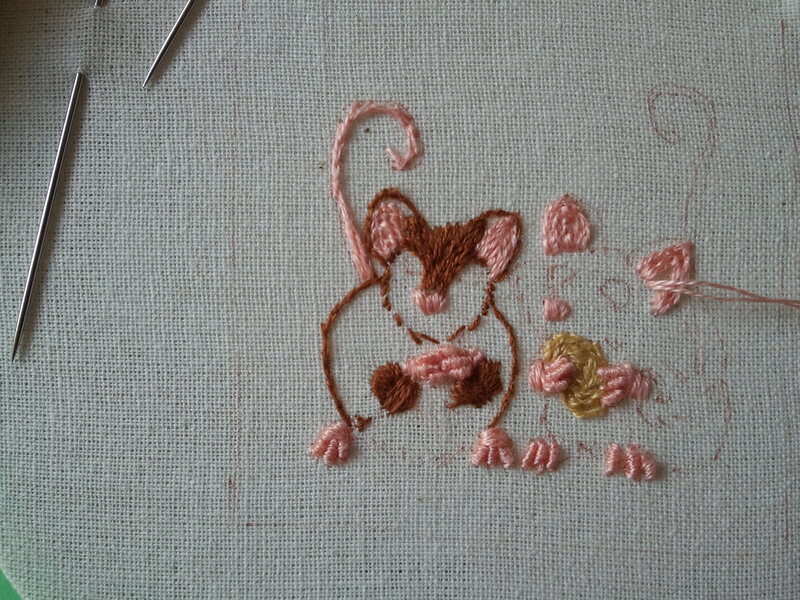 Rats, mice, they aren’t the easiest of critters to stitch. Thank you! The first thing my son (who’s 5) did when he saw it was trace the knots with his fingertip, then pet the dog. Needlework does lend itself to touchability.